Kern River Brewery: 13415 Sierra Way, Kernville, CA 93238. (760) 376-BEER (2337). Hours vary during season: Spring/summer hours M – Th 4 pm – 10 pm, F – Sn 11:30 am – 10 pm. Kitchen closes at 9pm all nights. Four Micro brews to choose from and with names like Class V Stout will make a nice pairing with your river adventure. Outdoor seating. Check out website for live music. El Jacalito Mexican is your best bet for anything authentic, spicy, and filling. It’s located in town at 11301 Kernville Rd. (760) 376-3834?. 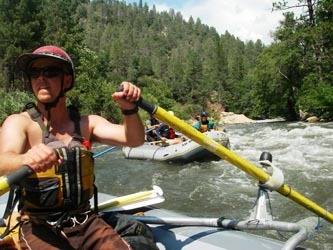 Realistically, after a couple days (or even just one day) of kayaking or rafting on the Forks, you will probably want to just stop and eat in Kernville, the nearest town to take-out. Your best bet is probably pizza at the Brewery or El Jacalito for Mexican Food (apparently they have great fried cheesecake). Big Blue Bear Coffee Shoppe: (760) 376-2442 get your pre-adrenaline, adrenaline rush in Kernville on Piute Drive. Nelda’s Diner: (760) 379-8448 Pizza, brews and milkshakes to die for. Located in Lake Isabella on Lake Isabella Blvd. If you want to get part of the drive home out of the way, head to Bakersfield. There are so many fast food joints, Mexican restaurants, and other places to eat in Bakersfield that you will have no problem finding something good to eat.